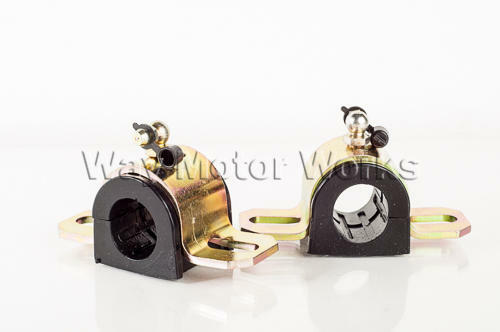 22mm Rear Sway Bar Bushing Replacement set for 22mm rear sway bars on your MINI. These are bushings and brackets with grease zerk fittings. If your using a cheapo rear sway bar and got the squeak here is your fix. These are the best sway bar bushings you can get made from the polyurethane with grease channels to hold in the grease. And to top them off the mounting brackets have angled grease zerks to make regreasing easy.